Revelation: Revelation 13 and Its "Beasts"
The two beasts described in Revelation 13 are among the most enigmatic parts of the book of Revelation, and they have inspired no end of commentary. What is the meaning of these two beasts? Let’s begin by briefly describing what John saw as the first beast. It was a monster having seven heads and ten horns — each with a crown — rising from the sea (verse 1). On each of the beast’s heads John saw a name that blasphemed God (verse 2). This beast derived his power and “great authority” (verse 2) from the dragon, who is identified as the devil and Satan (12:8). In fact, the beast was “given authority over every tribe, people, language and nation” — and they worshiped him (verses 7-8). One of the beast’s heads suffered a “fatal” wound from which it was miraculously healed (verse 3). The world was so astonished at this turn of events that it followed the beast. The beast was given authority to exercise his power for 42 months, during which time he was “given power to make war with the saints and to conquer them” (verse 7). We can begin our discovery by noting that the book of Revelation was written to Christians living in a certain part of the world. They were in seven cities in the Roman province of Asia, on the southwestern part of modern Turkey. An important principle for understanding the entities described in Revelation, such as the “beast,” is to begin with the fact that they had meaning for the people to whom the book was written. Therefore, we can find the answers to our questions by asking how they would have understood the beasts. While we cannot enter in a full discussion of the purpose of the book of Revelation, suffice it to say that it addressed a crisis of faith in the Christian communities in Asia. Some of the Christians were compromising their faith by entering into the idolatrous practices of the people around them, especially as it pertained to emperor worship. The book of Revelation calls the Christians of that day back to a worship of God and Christ (the Lamb) over against the wine of participation in the idolatrous worship in their community. The book also warns these Christians in Asia that they will soon face a period of unprecedented persecution, and it encourages them to follow the Lamb as their Lord and Savior. 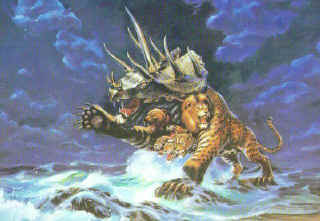 John does not give us the specific titles or names he saw on the head of the beast rising from the sea. But we can infer something of their nature by understanding John’s times, and noting that each of the beast’s heads had a “blasphemous name” (verse 1). This symbolism identifies the beast as the Roman Empire. The Roman emperors were called divus or sebastos, words that referred to a divinity they claimed or accepted for themselves. On coins minted in Nero’s reign, he is called the “Savior of the world.” According to the historian Suetonius, the emperor during which Revelation was most likely written, Domitian, was addressed as Dominus et Deus noster. It meant “Our Lord and God” (Suetonius, Domitian 13). Such titles were sacrilegious or blasphemous because only God is divine and only Jesus is Savior. Thus, the blasphemous names on the beast’s head are meant to expose his attempt to claim for himself the glory and majesty that belong to God alone. The Roman Empire, as symbolized in its emperors, considered itself to be a kind of savior of the world. Meanwhile, it ruled unjustly, usurped godly prerogatives and persecuted the church. In these ways, it revealed itself to be the “beast” of Revelation 13. The cult of the emperor in the cities of the Roman province of Asia and other blasphemous worship therein had real consequences for the Christians to whom the book was written. The Asian cities were among the foremost exponents of the emperor cult because they wanted to be seen as loyal supporters of Rome. They were keen to praise the Roman emperor as Lord and deity because they felt indebted to the empire for their prosperity and protection. It would have been considered unpatriotic to not participate in paying homage to Rome and the emperor, and atheistic to not pay homage to local Asian deities. This was the circumstance in which the Christians of Asia found themselves. Revelation shows that the power behind the throne of the Roman Empire or the beast was the devil himself (Revelation 12:8-9). The evil sea monster is exposed as the dragon’s proxy — an image of the dragon. The similarity of the dragon and beast from the sea (both have seven heads and ten horns (12:3 with 13:1), implies that a relationship exists between the two. G.R. Beasley-Murray says: “The beast rising out of the sea is a duplicate of the dragon, sharing his nature. His origin and shape declare him to be a further manifestation of the principle of evil which has been active against God and man through the ages” (The New Century Bible Commentary, “Revelation,” p. 208). Revelation tells us the beast’s mentor is the dragon or Satan, who gives him power, authority and a ruling throne (verses 2, 4). The dragon works behind the scenes through the beast, and he will not be mentioned much until chapter 20. But we know that he is the one who is responsible for leading the “whole world astray” (12:8). We can then define the beast from the sea or the Roman Empire as the agent of the dragon on earth. The beast is further identified as a political, military, social and economic power of universal proportions, which dominates the world (13:5-8; 17:3, 7-14). In Revelation, waters stand for nations under the sway of the monster from the deep (17:15). This would make, says George Ladd, “The Beast to be that which arises out of human civilization itself” (A Commentary on the Revelation of John, p. 177). In vision, John sees a remarkable tragedy strike the beast. One of his heads is struck with a sword and receives a mortal wound. The blow apparently kills the beast (verses 3, 14). Then, to the astonishment of people everywhere, the beast’s critical injury is miraculously healed. The beast has been resurrected from the dead, as it were! What does this strange scene from Revelation 13 mean? Many commentators think that the wounded head refers to a historical character, one of the Roman emperors of John’s day. Nero is the usual choice because of the bizarre myth that arose after his death. 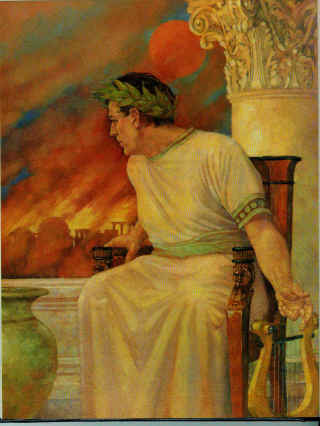 Nero committed suicide in June of AD 68. However, a rumor arose and persisted that he had not died but had fled across the Euphrates river to Rome’s arch-enemy, Parthia. It was said that one day Nero would return at the head of Parthian armies to destroy Rome. This became the so-called “Nero redivivus” myth. In fact, during the decades following Nero’s death, several pretenders did come forth claiming to be Nero (Tacitus, Histories 1.78; 2.8; Suetonius, Nero 57). By the turn of the first century a further twist was added to the Nero legend. It was said he would actually rise from the dead, return to Rome and seize the empire. It was in this context that Revelation was written. This myth of Nero’s return so captured the popular fancy that it found its way into Jewish and Christian apocalyptic writings. Here the triumphant Nero was sometimes even pictured as the antichrist (Ascension of Isaiah 4:1-14; Sibylline Oracles 4:119-124; 5:137-154, 361-374). The Nero legend may have played a crucial role in Revelation’s telling of the story, and served as a warning to Christians to not join in the idolatry of the world. There may, indeed, be a direct though symbolic reference to him in Revelation 13. If so, it is not to be taken literally, as though Nero himself is the beast’s slain but resurrected head. He would simply be a type of the empire to whom John could point. Church members in Asia, of course, would have been quite aware of the Nero myth. It’s tempting to speculate that Revelation may have capitalized on the “news event” of the day to get across its message about serving the Lord rather than anything else. In identifying Nero as the background of the wounded “head,” we should be cautious in how we understand it. Remember that it is the beast itself who is said to receive the fatal wound, even though only one of its heads receives the mortal blow (verses 12, 14). The point is, we should be looking for the revival of the beast as a whole in John’s time, not in an individual ruler. Interestingly enough, the empire did go through what appeared to be a “mortal wounding” after the death of Nero. In one year, three emperors assumed the throne and were deposed. Civil war was rampant. It appeared as though the Roman Empire was about to disintegrate. But the succeeding emperors, Vespasian (AD 69-79), and his son, Titus (79-81), brought stability. Rather than disintegrating, the empire went on to unprecedented heights of power that shocked the various kingdoms and nations that fell under its military, political and economic sway. It is against this backdrop that Revelation 13 made its point to the Christians in Asia: Yes, a “Nero” certainly has appeared to return from the dead in a reborn Roman Empire. Yes, the world is enamored with the empire being “resurrected” to a now greater, world-ruling power. Yes, this restored beast inspires awe in the citizens of Asia, and of the world. (How they worship the empire in Asia!) Well, don’t be fooled into worshipping the beast along with the people of the world; worship God. Some have speculated that the wounding of the beast refers to the destruction of the Roman Empire in AD 476. The empire is then said to have been miraculously “resurrected” or revived by Justinian in AD 554. Of course, we cannot demonstrate such an assertion from the context of Revelation 13. The problem with this idea is that if the wounding refers to something that occurred in AD 476 and AD 554, then this material in Revelation would have had no meaning for John’s original audience, who lived around AD 100. Yet, the book was written to them. This means we are advised to look for an interpretation of the symbols of Revelation 13 in terms of the understanding of the Christians in Asia who lived around this time. Is there an eschatological or end-time fulfillment to Revelation 13 as well? It’s clear that Revelation as a whole does have in view such a time when “the kingdom of the world” will “become the kingdom of our Lord and of his Christ” (11:15). Chapters 19 and 20, for example, point to a time when the Lamb will return as a victorious king and the people of God will be given their reward. It’s possible that Revelation 13 could speak to an end-time activity of evil world power. In the words of George Ladd: “The symbolism of emperor worship in Asia Minor forms only the background for the vision of the second beast, whose power and influence will go far beyond anything known in the ancient world. The experience of emperor worship provided only echoes of the terrible reality which will be fulfilled in the last days” (A Commentary on the Revelation of John, p.183). As long as we do not go beyond a general assertion of the following New Testament truths, we are on safe ground: Jesus will return again, the dead in Christ will rise, God will judge the world, his kingdom will fill the earth in all its fullness. But to claim that a specific time in history is the eschatological fulfillment of Revelation 13 is to go beyond John’s interest. To say that the 13th chapter gives us a blueprint for how “end-time” events will work out is to bring ideas into the text that the book doesn’t contain. In short, we have no way of knowing what the specific political, religious or economic outlines of the “end-time” will be like. Nor do we know when such events may occur (Mathew 24:36; Acts 1:6-7). Of course, we can certainly see the principle of Revelation 13 at work throughout history — before and after John’s time. In fact, the Roman Empire of John’s day is itself called “Babylon the Great” (18:2) after another power that dominated a good part of the world in its time. Symbolically, Revelation can also be interpreted as making a point about any evil and oppressive government that seeks to usurp the lordship of God and parody his holiness. Some commentators point out that the wounded and resurrected beast may be presented as a parody of Christ’s death and resurrection. Previously, John had seen the Lamb “looking as if it had been slain,” a reference to Jesus’ crucifixion (5:6). Now, the beast appears to be slain as well, but miraculously recovers. Jesus rose from the dead and his “deadly wound” from crucifixion was “healed” by his resurrection. The risen Christ told the church at Smyrna that he is the one “who died and came to life again” (2:8). But the beast, too, has come back to life and appears to be healed. In short, the beast appears to be “resurrected” to life as was the Lamb. But Christ will ultimately judge the empire, and the world will know who is its true Lord and Savior. In the meantime, the beast is allowed to organize and rule an ever more powerful, world-ruling kingdom. For this reason, the whole world is astonished at the beast who had a fatal wound — that is, seemingly in total disarray and collapse — but who lives (verse 3). That is why it idolizes the empire! “The ‘Christ’ of the Devil comes from death — and the world worships him!,” says G.R. Beasley-Murray (The New Century Bible Commentary, “Revelation,” p.210). In Revelation 13:4, then, Christ through John told the churches in Asia to make no mistake about what they were faced with. The beast from the sea — the Roman Empire — and its officials in Asia created a society that was spiritually attractive, though pagan and blasphemous to the core. Only through Christ and the Christian’s faithfulness in him, can it be resisted and defeated. That important spiritual consideration is the point of chapter 13. John is not interested in chronology or creating a blueprint of end-time events. In verse 5, the beast is said to have been “given a mouth to utter proud words and blasphemy and to exercise his authority for forty-two months” (13:5). Perhaps we are to see some irony in the use of this “mouth” metaphor. The mouth in scripture is the symbol for the thoughts that are revealed in talk. The Psalms speak of the evil man as having a “bad mouth” (Psalm 10:7). The mouth of the beast utters evil — blasphemy — though the world does not recognize it for what it is. The model for this characteristic of the beast is the little horn of Daniel 7:8, who had “a mouth that spoke boastfully.” This horn “will exalt and magnify himself above every god and will say unheard-of things against the God of gods” (Daniel 11:36). To blaspheme against God is to profane or dishonor his name and violate his glory and deity. Clearly, the beast claims a divinity he does not have. He seeks to put himself in the place of God — the ultimately blasphemy. This beast “was given authority over every tribe, people, language and nation” (13:7). His slavemaster, the dragon, is the source of the beast’s authority. The devil gives the power of the kingdoms of earth to whomsoever he wills, under God’s overall sovereignty, of course. The time in which the Christians of Asia live is the “already but not yet.” The kingdom of God had already broken through our world in the redemptive work of Christ. Christ had defeated the devil, and all power and authority in heaven and earth had been given to Christ (Matthew 28:18). But, according to God’s purpose, his kingdom has not yet replaced the kingdom of the world. Christians must live in that world but not be of that world. God still allows the beast to appear supreme in the affairs of mankind. Thus, all of earth’s inhabitants worship him (verse 8). This was the lesson given to the Christians of Asia. The Roman Empire seemed to be an unbeatable monster, with its worldwide political, military and economic power. “Who is like the beast? Who can make war against him?” people said (verse 4). But the inhabitants of the world didn’t just fear the empire; they also loved and worshipped it. In Revelation, the world is shown to willingly accept the beast’s authority, and to give no regard to God. “All inhabitants of the earth will worship the beast,” says Revelation (verse 8). The beast captures the hearts and souls of men and women everywhere, but it must not capture the spirit of the Christians of Asia. Revelation 13 shows this beast to be the earthly foe of the church. We are told that the beast “was given power to make war against the saints and to conquer them” (verse 7). Satan uses the political power of the beast as his agent in an attempt to stamp out and destroy God’s people. There will be but two choices for Christians in Asia when the state-dominated persecution begins in earnest: Christ or the monster-beast. Jesus’ warning to his disciples will fully come to pass for Christ-followers in the seven churches: “Then you will be handed over to be persecuted and put to death, and you will be hated by all nations because of me” (Matthew 24:9). This beast will be allowed to exercise its power over the world and the church for only a very short time of 42 months or 3½ years during the persecution on the church. (Numbers such as 3½, 7, 1000, and so on, have symbolic value in Revelation. We should take great care to not interpret them in a rigidly literal manner.) God will then step in to stop the demonic madness, which has taken over the earth and threatens to annihilate the church. Chapter 13 introduces us to the two agents through whom Satan carries out his war against the people of God. The first beast from the sea was grotesque, with seven heads and ten horns. It possessed the combined characteristics of leopard, bear and lion. The second beast comes out of the earth. His appearance is not so terrifying. While he speaks with the power of the dragon, he has only “two horns like a lamb” (13:11). This beast is later identified as “the false prophet” (16:13; 19:20; 20:10). We remember Christ’s warning to watch out for false prophets who “come to you in sheep’s clothing, but inwardly they are ferocious wolves” (Matthew 7:15). That is what this beast is — a wolf in sheep’s clothing. He pretends to be something he is not, morally and spiritually. In reality, this beast is as terrifying as the one from the sea. This second, earthly beast performs awesome miracles (verse 13). The New Testament writers warned much earlier that false Christs and false prophets would perform incredible signs (Mark 13:22; 2 Thessalonians 2:9). God would allow an unrepentant world to be bombarded with the miraculous as a “powerful delusion so that they will believe the lie” (2 Thessalonians 2:11). The Bible had long ago warned that a criteria of truth must be applied to miracle-working prophets who claim to come in God’s name. They must speak the truth, and not lead others into idolatry, false teaching or to do things in violation of God’s will (Deuteronomy 13:1-3). To the elect people of God it will be clear that the false prophet or beast from the earth is bringing a spiritually corrupting message. His attempt to establish idolatry will be revealed in the fact that he orders mankind to worship a human leader and system rather than God (13:14-15). It is specifically said of this false prophet that he will cause “fire to come down from heaven to earth in full view of men” (verse 13). Revelation pegs the second beast or false prophet as a fake Elijah. Like the true Elijah (2 Kings 1:10, 12), the false prophet will also cause fire to come from heaven and devour his enemies. Some commentators also see in the symbol of fire from heaven a parody of the two witnesses. As the false prophet stands before the beast, the two witnesses stand before “the Lord of the earth” (11:3). They destroy their enemies with the fire that comes from their mouths (11:5) and so the false prophet calls down fire from the sky. This situation is reminiscent of events that occurred on the eve of the Exodus. When Moses performed a miracle before Pharaoh to convince him to release Israel, his sorcerers also performed a similar sign (Exodus 7:11, 22). Even as Pharaoh’s sorcerers opposed God and Moses — and hardened Pharaoh’s heart — so the false prophet validates the beast in his own delusion of divinity. The main function of the second beast or false prophet is to cause the world to worship the first beast, who represents secular political power. Thus, he is something of a chief priest in the beast’s kingdom. The second beast establishes the ideological foundation of the anti-God empire or kingdom on earth. He creates the instruments and rituals of worship in his name. The second beast uses his religious authority to underpin the political, military, social and institutional power of the first beast. The second beast has been called the antichrist’s Minister of Propaganda. In many respects his nefarious work is a parody of Christ establishing the kingdom of God. This beast is, above all, the champion of the Evil One, the devil. “The second beast is not so much the ‘henchman of the first’. . .as the ‘Secretary of State’ who implements or institutionalizes the dragons’ evil vision,” says Robert W. Wall (New International Biblical Commentary, “Revelation,” p.171). The second beast’s role is to bring people to worship the first beast and promote his aims, who in turn is a proxy of the devil. The two beasts use ideology, miracles, economic boycott and threats against the person to dominate the world. In this role as the beast’s religious cheerleader, some have speculated that the beast of the earth represents the hierarchy composed of the leading citizens of Asia and its people, who are quick to worship Rome and the emperor. The false prophet sends out a universal order to “set up an image in honor of the beast” (verse 14). Then, a strange thing happens. We are told the false prophet, “Was given power to give breath to the image of the first beast, so that it could speak and cause all who refused to worship the image to be killed” (verse 15). We are reminded of the nearly 100-foot high golden self-image that Nebuchadnezzar set up in the plain of Dura (Daniel 3:1). He commanded all people to worship the image. Whoever refused would summarily be tossed into a blazing furnace and killed. This is, in principle, the kind of idolatry Revelation 13 is describing. Strangely enough, the false prophet gives the inanimate image breath so that it can speak. Thus, the second beast has power to animate the image of the first beast. In the time Revelation was written, this was not an alien idea. The ancients believed that statues spoke and performed miracles. It was thought that the gods and demons used statues as conduits to communicate with humans and work miracles. For example, the heretic Simon Magus is said to have brought statues to life (Clementine Recognitions 3.47; Justin, Apologia 1.26; Irenaeus, Against Heresies 1.23). In ancient times, that was precisely the point of having idols. People thought that the life of the person or being was actually in the idol. In summary, then, the original purpose of Revelation 13 was to show the Christians of Asia that the Roman Empire and the worship of the emperor and local deities was not of God. There was no point of compromise between this Babylon the Great and the people of God. The churches were warned that a time of persecution over these issues would befall them. The members were to stand fast in the faith of Christ, their slain Lamb, even if it led them to their death. In death or martyrdom they would witness to the fact that a greater than Caesar was alive, Jesus the Alpha and Omega. In the end, the church would win and the martyrs would reign with Christ as priests and kings.